The Pet-Dek is soft and comfortable, yet weighs 12 lbs but can support up to 200 pounds (multiple dogs) no problem and your dogs will love having a level, soft surface to help them travel with less stress! The Pet-Dek was designed to maximize the use of the back seat by making a level deck to transport your dogs, kennels or household goods, etc. Holding up to 200 pounds, it creates 8 square feet of LEVEL, comfortable space in your car or truck. It fits almost every 4 door vehicle, and works well with trucks (with large trucks or large SUVs there is a 6 inch gap at each end that can be filled with a blanket or pillow). It can take most of the angle out of the back seat and comes with a machine washable anti slip carpet to make your pet comfortable. What Can I Use The Pet-Dek For? * Transport your pets or kennels with a firm but comfortably soft, flat surface. * Allows your dogs or pets to fully lay down while traveling without having to struggle with unlevel seating. * Gives 8 square feet of flat surface in your back seat which is up to 40% more then now. 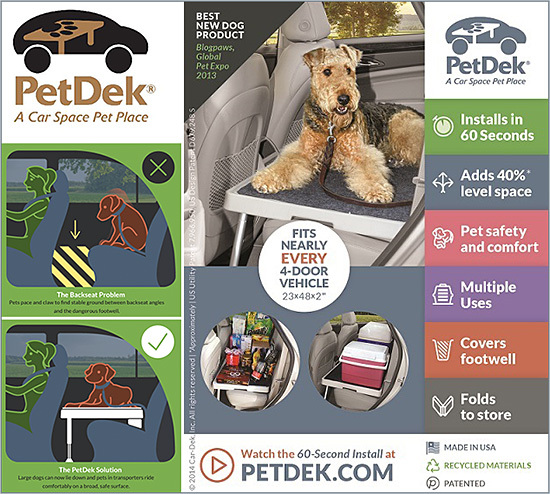 How Does Pet-Dek Make My Dog More Comfortable With Car Travel? The PetDek is rigid but not hard, and the carpet adds softness. The large support area, about 8 sq. ft. (.74 sq. meters), covers the footwell area, giving dogs the feeling of more security in a moving vehicle and protects them from falling into the footwell during a fast stop. Besides extending space forward, the PetDek also raises your dog up to 2–4 in. (5–10 cm.) so can see more clearly out the window, and be closer to you. Do I Need To Leash My Dog With The Pet-Dek? Pets can sometimes be tempted to leap from an open window or car door. For optimal safety, we must recommend leashing your dog to the seat buckle. Depending on your backseat design, there is a space where the rear of the PetDek meets the seat backrest. This is intentional, so that you can access seat belts to connect commercially available pet restraints. Such restraints are highly recommended. Some states require it and will penalize offenders. The PetDek allows access to the normal anchor points for this. Due to many variables in pet size and weight, a safety leash is not provided with the PetDek. Do not use the PetDek legs to tie down leashes. Will The Pet-Dek Damage My Seat? Not at all. There are no metal components or screws used where the PetDet contacts with your vehicle seat. And because no seat straps are needed, it won’t cause friction on your seats. The PetDek undercarriage is molded not to leave impressions in your seat. It does not attach to the front seats in any manner so no annoying "jerking" by a pet moving around or straps rubbing the back of your neck. Is Pet-Dek Easy To Install? Yes, typically takes 1 minute. See Our “Is It Easy To Install” section on our FAQ page with full description. Will It Fit My Large Truck or Large SUV? If used in a full-size truck or large SUV, check the 23 inch (58 cm.) width for front to rear spacing. The PetDek’s 48 inch (122 cm.) length may leave large gaps on each side, so please measure before ordering. Solutions used have been filling the gaps with pillows and/or using a shorter restraining leash/strap, which we always recommend when transporting your pets. Some smaller cars do not have 23 inches front to rear in the back seat especially if they have a center console. Please measure carefully. What Is Pet-Dek Made Of and What Color Does It Come In? The PetDek is made of a polypropylene plastic, similar to the lid that seals a picnic cooler. Made 100% in the USA from recycled materials. For the color—we chose the color Fawn, the name for a very light brown/grey. We found this to be the most desired color, matching most vehicles. The added machine-washable pet carpet is Charcoal Grey. How Much Does the Pet-Dek Weigh? At only 12 lb. (5.4 Kilo), the PetDek is easily handled by men, women and even teenagers--- and supports a hefty 200 lb. (80 kg.)! That’s 200% more than any conventional backseat pet solution. It’s also a lot easier to install than seat hooks and adjustable straps. Can I Use Pet-Dek With My Children’s Car Seat? No, the PetDek can not be used in conjunction with children’s car seats or with humans sitting on it. The PetDek must be removed from the back seat when it is needed to carry children or adults in that area. These rules are for safety and from the children’s car seat industry. How Much Does The Pet-Dek Cost? The Pet-Dek is only $134.95 and that INCLUDES Shipping within the continental U.S.!!! The PetDek is a patented, molded rear seat shelf, engineered to expand and protect your car. It converts the back seat into a practical cargo and pet passenger area. In addition, it’s easily folded and stored in the trunk. The PetDek adds versatility, safety and convenience that is readily available for multiple uses. Pet-Dek is made to last and will change your traveling life for the better! If you have a business, it will likely be a “tax write off”. Made in America, the Car-Dek warranties the PetDek, for which it receives payment, for lifetime against manufacturing defects. Soft goods excluded. Order today and let us change the way YOU and your pets Travel— for the better!